Dimensions 626'8" by 57'11" by 23'9"
The Kirovs were modern cruisers constructed by the Soviet Union at the Vladivostok naval base as well as other Navy yards. They were the first large warships laid down in Russia since the October Revolution of 1917. 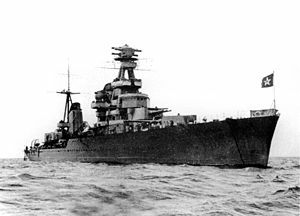 Ironically, with Russian industry still struggling to modernize in 1933, the Russians sought Italian assistance in their design and they were based on the light cruiser Raimondo Montecuccoli. The design was modified for the heavy seas and severe icing of the Baltic. Neither participated actively in the brief period of Russian hostilities against Japan, but would doubtless have been employed against any significant light forces that Japan might have scraped together against the Russian landings in the Kuriles. Armed with 7-inch guns, they were technically heavy cruisers but were intermediate between the heavy and light cruisers of those nations that adhered to the Washington naval limitations.